Čauko rád by som sa opýtal či minevie niekto poradiť. Radi by sme s chalanmi niečo poliezli v ČR neake pekne sklaky s nejakym kempom poblízku poprípade aj nejakou vodou. I am looking for a partner to climb with in Brno. I used to climb about 2-3 years ago and would like to start doing that again. I would consider myself as false beginner/intermediate. I think I could catch up quickly with my level tough. Hi, is there any one or group going Pakistan in this summer 2014 for climbing and trekking? 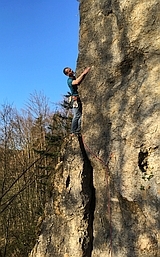 i am going to move to Brno for my exchange semester in April and im am looking for a climbing partner. I am very motivated and looking forward to train. What is the best guide for Petrohrad ? And where can i get it ? Ahoj, vyzkoušej raději diskuzi na české jazykové mutaci Lezec.cz (nebo stiskni českou vlaječku v záhlaví). Anglická mutace je určena především pro zahraniční lezce.